Baigan ka bharta is made in many ways. I made it in a very different way. It is very tasty. This Baigan ka bharta cooked on induction cooker, can also be cooked on gas stove or electric stove. It is easy to cook and delicious. Eggplant helps in reducing cholesterol level. Its found that laboratory animals with high cholesterol when given eggplant juice; their blood cholesterol, the cholesterol in their artery walls, and the cholesterol in their aorta – an artery that returns blood from the heart back into circulation into the body, has significantly reduced. 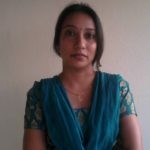 How to choose perfect eggplant for eggplant mash? Choose eggplants that are firm and thick in size but light in weight. Their skin should be smooth and shiny, and their color should be vivid. They should be free of discoloration, scars, and bruises, which usually indicate that the flesh beneath has become damaged and possibly decayed. The stem and cap, on either end of the eggplant, should be bright green in color. As you would with other fruits and vegetables, avoid purchasing eggplant that has been waxed. To test for the ripeness of an eggplant, gently press the skin of eggplant with the pad of your thumb. If it springs back, the eggplant is ripen, while if an impression or stain remains, it is not. It is not recommended to use ripe eggplant with seeds in this recipe. Also, avoid buying younger, smaller eggplants as it may be bitter in taste. Although they look hard, eggplants are actually easily perishable and care should be taken in their storage. Do not cut eggplant before you store it. It perishes quickly once its skin has been punctured or its inner flesh exposed. Store complete eggplant wrapped in a plastic bag without washing, in refrigerator. While cutting an eggplant, use a stainless steel knife. Since carbon steel will react with eggplant’s phytonutrients and cause it to turn black. Wash the eggplant first and then cut off the ends. To tenderize the flesh’s texture and reduce some of its naturally occurring bitter taste, which can cause some people to avoid cooking with them or eating them. After cutting the eggplant into the desired size and shape, sprinkle it with salt and allow it to rest for about 30 minutes. This process will pull out some of its water content and will remove its bitter taste also. This also makes it less permeable to absorbing any oil used in cooking. Remove the salt by washing it off before cooking. 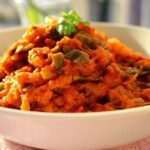 Baigan Bharta, an eggplant delicacy ! 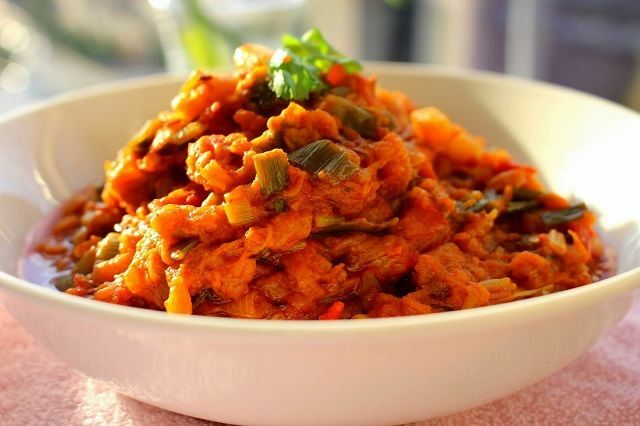 Mashed eggplant sauteed with onion, tomatoes and Indian spices makes it a great vegetarian dish. This mashed eggplant prepared without roasting is easy to prepare, and always works perfect. Remove stalk from eggplant. Peel the skin of round eggplant and cut it into thick round slices. Then chop the circular eggplant slices into 1 inch square pieces. Dip these eggplant pieces into a bowl filled with water. Dipping the eggplant pieces in water prevents them from rusting, otherwise eggplant pieces will turn black. If do not want it to dip in water, sprinkle some salt on the choped pieces and keep is aside. Finely chop the tomatoes, spring onions, capsicum, green chili and fresh coriander leaves. Heat oil in a pan. Once hot, add cumin seeds. Reduce temprature. Add asafoetida, turmeric powder. Add finely chopped green chili and 1/2 inch piece of finely chopped ginger. Slightly roast the spices then add onions, and sauté, stirring occasionally till the onions are translucent. Add tomatoes to it, add red chili powder, coriander powder. Roast the spices well till the tomatoes are mashed and oil starts separating from it. Stir it at regular intervals and keep temprature to medium. Once spices got fried, add chopped capsicum to it. Fry it slightly but do not add water at all. Adding water to spices will make the eggplant watery. Now remove water from eggplant pieces previously dipped in water, and directly put the eggplant pieces in the wok. Add salt to taste. Mix well and cover it. Cook for 4-5 minutes with closed lid. After 5 minutes, check the eggplants. Stir the mixture very well. Mash the eggplant a little with spoon then again cover and cook it for 5 minutes. Now open the lid add garam masala and green coriander mix well. Give it a final mash using a masher, so that no lumps remain. Continue to fry the mixture, without lid for 1-2 minutes, till the oil starts to ooze out from the sides. Your baigan ka bharta is ready to serve. Transfer the eggplant mash in a bowl. Decorate it with chopped fresh coriander leaves and chopped spring onions. Serve hot with chapati , paratha or naan.